The Arts By The Sea Festival is an annual collaboration between Bournemouth Borough Council and Arts Council England bringing together an ambitious and contemporary festival of combined arts to Bournemouth! This year, CuCo were extremely proud to be appointed as the branding agency to design all brand creative for the festival – which would then be rolled out across all hard and printed marketing and advertising materials! The arts organisation first approached CuCo with the task of designing their 40 page brochure – including a completely new look and feel. 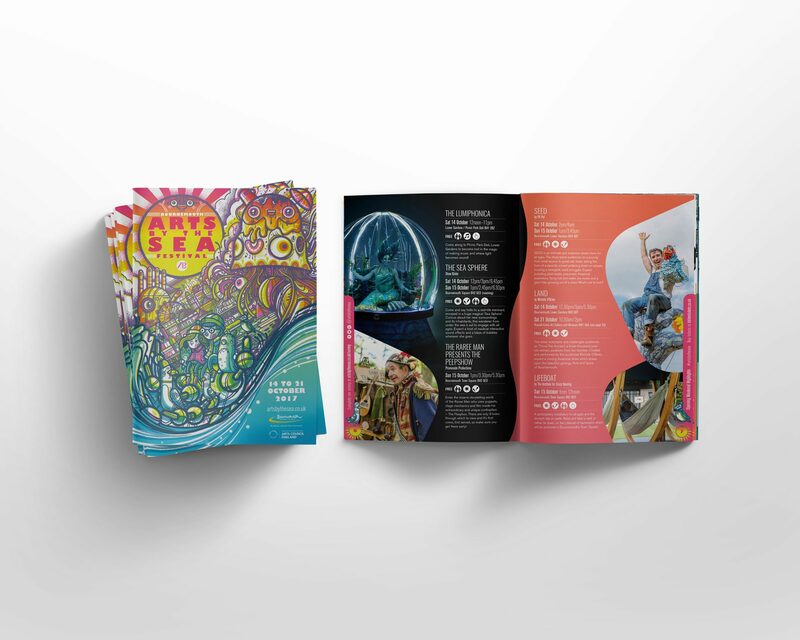 It was felt that last year’s brochure design was very text-heavy, and as the whole concept of the festival is very visual-orientated, they wanted to incorporate a lot more imagery into the styling. Having seen our creative work for Pavilion Dance South West, the festival’s organisers were keen to use large, striking images as backgrounds for the page. Whilst they knew they had a lot of events with a lot of content to promote within the 40 pages, they didn’t want crowded pages full of tight text paragraphs – so asked for us to be selective with the imagery and choose the very best images to make features of. The festival takes on a different theme each year, and this Autumn Arts By The Sea is renewing its focus on environmental issues with the theme of… Plastic Beach! Themes such as being eco-friendly and recycling will be explored, with artists and creative partners invited to explore the tension between ecology and industry. 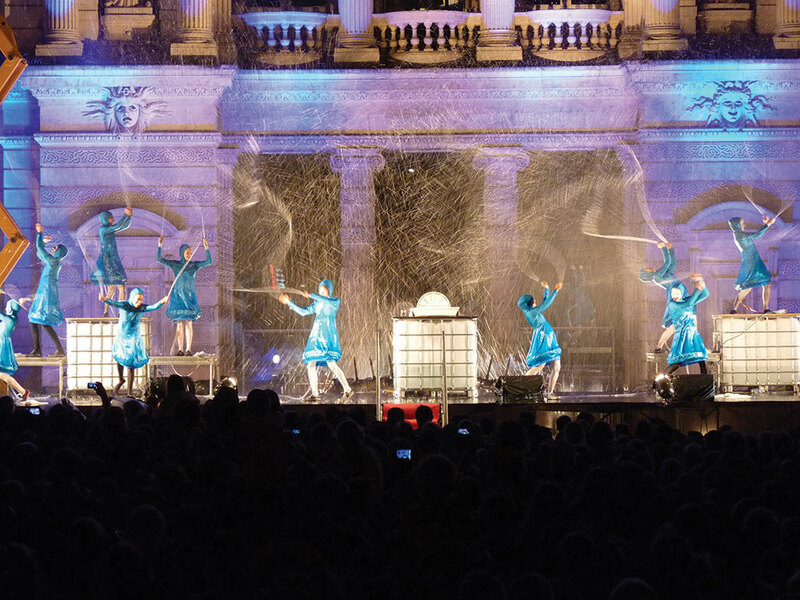 The arts organisation are committed to delivering as green an event as possible and the issues of marine pollution and other environmental problems are raised in many of this year’s performances, exhibitions and installations. In order to communicate the ‘beach’ element of the theme, our design team created a waved line effect into the creative design. The wave acts as both a graphical mechanism and also represents the shoreline in a subtle and contemporary way. Both this year and last year, the cover of the brochure was designed by artist, Drew Millward, who is an illustrator with a very distinct stye (check out some of this incredible work here!) The arts organisation wanted to incorporate the style of the cover Drew created throughout the inner pages, as they felt that last year the cover felt somewhat separated from the rest of the literature. To overcome this challenge, our design team took several elements from the cover design, such as the birds and the sun, and incorporated these visuals into the page number illustrations. We also used the same colour palette throughout as those used in the cover, selecting a different colour for each section of the programme. There are six different sections in total, including the opening highlights, green arts by the sea and sounds by the sea. The arts organisation also wanted to draw attention to their social media content and website, as these haven’t been highlighted very clearly in previous years. We therefore incorporated a border/tabs/sidebar style into the design which were colour-coded, making it easy for users to identify which section they are in. These sidebars also contain the social media icons and their handle for each one (@artsbythesea), along with the link to their website. Lastly, the organisers wanted to include a map within the brochure. 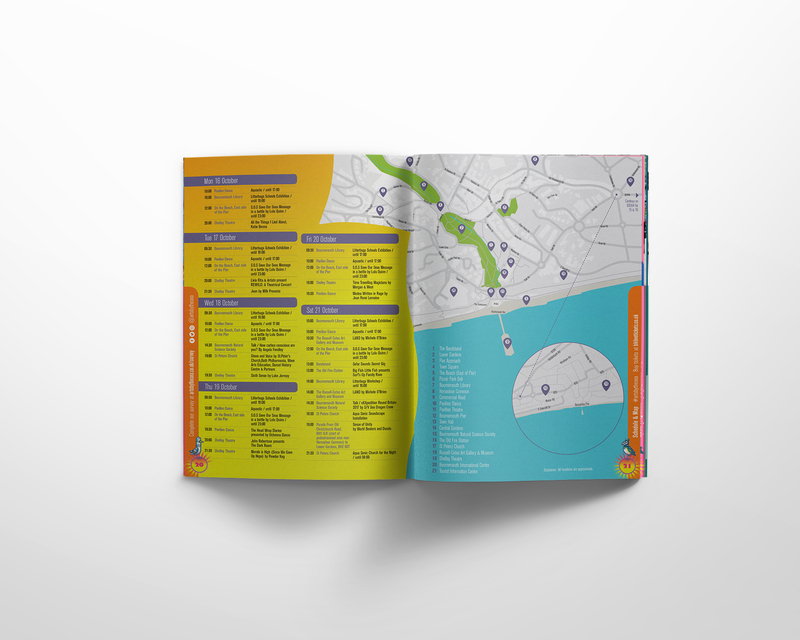 The many festival locations are very widespread and they wanted people to be able to use the brochure as a tool to plan their time, rather than just an overview of the events. We therefore created a map and made the schedule of events more of a design feature. Alongside the brochure we have also produced a wide variety of marketing and advertising materials for the festival, including posters, flyers and advertisements. These designs also follow the creative style we have developed, incorporating a variety of images and the Arts By The Sea logo. If you’re looking for an agency to develop your brand or simply just a brand re-fresh, give CuCo a call today on 01202 911959 or drop us a line at hello@cucocreative.co.uk. We’d love to hear from you!